Save the Climate Game is appropriate for all ages but especially children and youth. It’s intended to help participants understand what they do on a regular basis which contributes to or reduces their greenhouse gas impacts. Teams go through a set of behavior cards (eg, ride my bike to school or leave the lights on when I leave the room). If anyone in their team does that behavior, the card goes on the board. They can score their climate impact by counting positive and negative behaviors. Then they work together to come up with ideas to reduce their impacts. The basic board has players distinguish between actions that contribute to greenhouse gases or not. 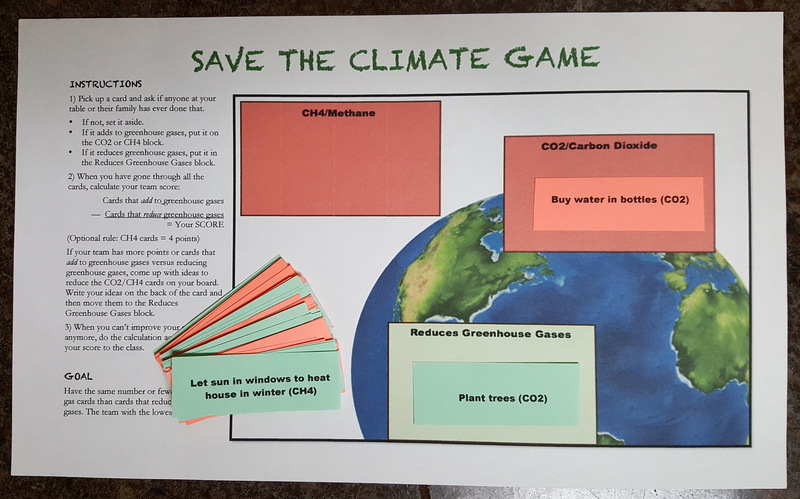 The advanced board game has players also distinguish whether the actions contribute to CO2 or methane and the latter has a higher score. Because the game is played as a team, the team is held jointly accountable, in the same way we are all affected by other people’s climate action or inaction. Participants have to take responsibility publicly for their actions which can change norms. Participants are broken into teams and given a stack of cards representing actions that contribute to climate change and ones that reduce those impacts. As each card is read, the participants at the table declare whether they or their households typically do that behavior. If so, the card is placed on the board. Climate change is a scary prospect. People need to feel empowered to make a difference. This game helps people take responsibility for their actions and come up with strategies to reduce their impacts in their daily lives. Players will discover what contributes to greenhouse gases. Players will learn what mitigates our climate impacts. Players will understand how our actions affect everyone.